I agree that WinSCP is different --it is a great app well above the average. You could, if you please, let us use F5 on the focused tree. I'm sorry to dig this up. Google took me here. Apparently I'm experiencing the same problem of "cannot drag to choose more than one file." When I start to drag and drop to choose multiple files, they get highlighted. But when I release the mouse button, only one file will eventually be selected. This happens to both the local and remote panes. My PC is running Windows 7 Ultimate, with all latest updates and patches. I hope this will help improve the program further more. I love it. What version of WinSCP are you using? Have you tried the latest version? Some way to copy an entry from "Session Location profiles" to "Shared Location profiles". Considering WSCP now remembers opened session folders, it could also remember the last used session and make it selected by default if it is inside an open folder. This way, we can start the last session with just an Enter when the program starts. Thanks for adding them to tracker. But where is that "option to disable it"? (not that I would use it, just can't find it). Optimize connection buffer size on Connection tab of Login dialog. Add an item "Lock Toolbars" in the right-click menu of toolbars inside session panels. Option to display file sizes in long format (instead of short format) on status bar. 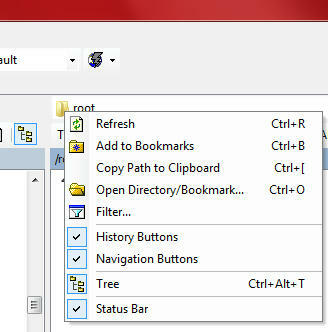 Option to set F5 hotkey to Refresh instead of CTRL+R in Command interface. Because that is the default key for refresh everywhere in every OS, why this interface should be different? "Index out of bounds" when changing directory View style when using Explorer interface, and nothing is displayed in file list afterwards -- anyway, I've never tried this interface before. Can't left click + drag'n'drop more than 1 item selected, ie. I select many files, but when I click to drag them, only 1 stays selected and is actually dragged. Special thanks for this fix: "Increased socket internal buffer size for SSH with option to disable it. It improves transfer speed"
With previous versions I was only uploading at a low 35KB/s, now I can do it at my full 630KB/s speed.